Hurn House is an established halls of residence, newly acquired by AUB for 2017. It is located in the popular Lansdowne area of central Bournemouth and is suitable for undergraduate students. 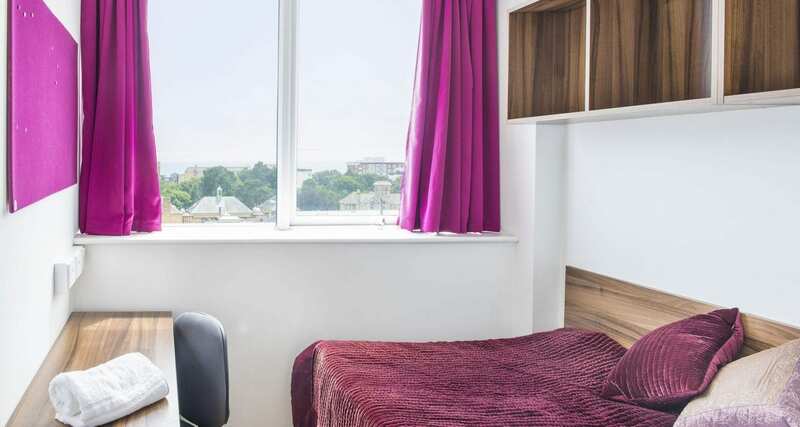 There are 153 rooms available, which are arranged as single ensuite rooms in cluster flats with a shared kitchen / lounge or as single, double or large double self-contained studios with their own kitchen facilities. All rooms and studios have fully wired and WiFi internet access. There are on-site laundry facilities, and a large common room with lockable mailboxes and onsite bicycle storage. Halls reception / security staff are on site 24 hours a day. Located within 5 minutes’ walk of Bournemouth beach and the town centre, Hurn House is ideally located close to the town’s restaurants and shops, as well as nearby transport links such as the bus and train station. All rooms and studios are single occupancy and all halls of residence are strictly no smoking. Travel to the AUB Campus (approximately 2.5miles away) takes 15 minutes by bus or bike. The Unibus service provides regular direct buses to the AUB campus; an annual season ticket currently costs £250.00, or ten journeys for £10.00. The deposit will be £250.00. To see Hurn House’s location on a map, click here.